Nguyen Dac Kien was sacked from the Family and Society newspaper less than 24 hours after he published an essay on his blog -- which quickly went viral -- criticising a speech by the party's general secretary Nguyen Phu Trong. The newspaper falls under the remit of the Ministry of Health. Vietnam, a one-party state that forbids political debate, routinely jails or places under house arrest activists and bloggers for publicly expressing dissent and challenging the communist party's rule. "I am not surprised. 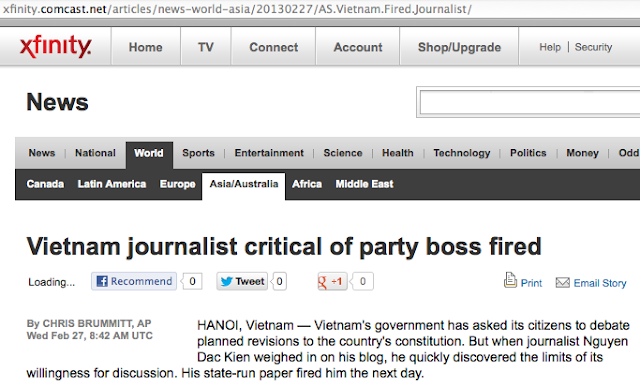 After what I wrote (my removal from the paper) was easy to predict," Kien, who had worked at the newspaper since 2008, told AFP by telephone. "I disagree with his (Trong's) speech... 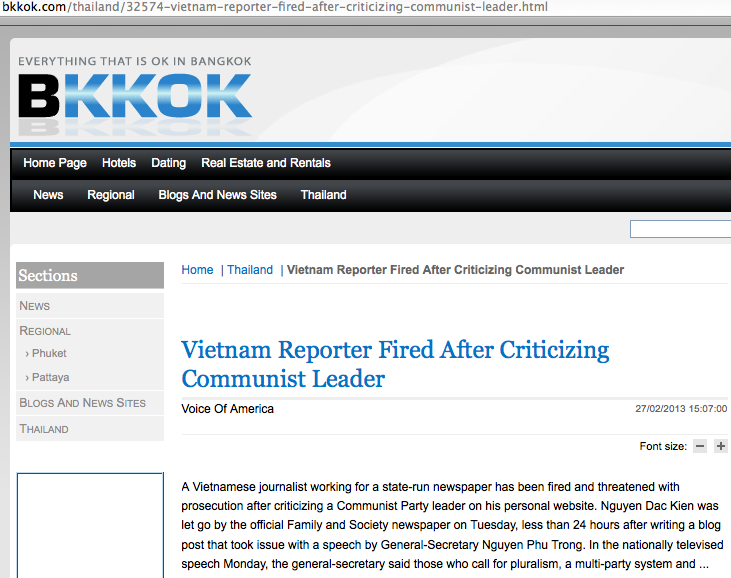 I think it is unacceptable," the 29-year-old reporter said. The newspaper said in a statement that Kien was sacked for "violating the operation status of the newspaper" and would have to take "personal responsibility" if prosecuted. Speaking on Monday Trong, one of Vietnam's most powerful leaders, accused people calling for political reforms in the authoritarian state of showing "political, ideological and moral deterioration". 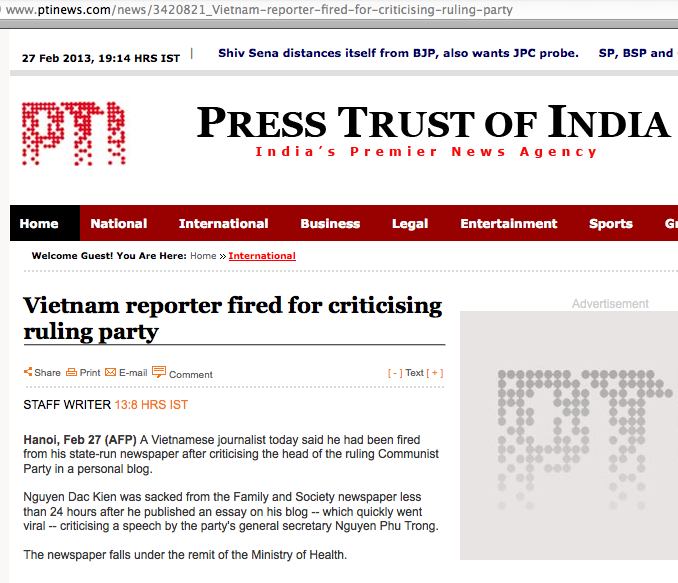 "Who wants to deny the Communist Party's leading role? Who wants pluralism and a multi-party system? Who wants separation of power?... This must be nothing else but deterioration," he said. 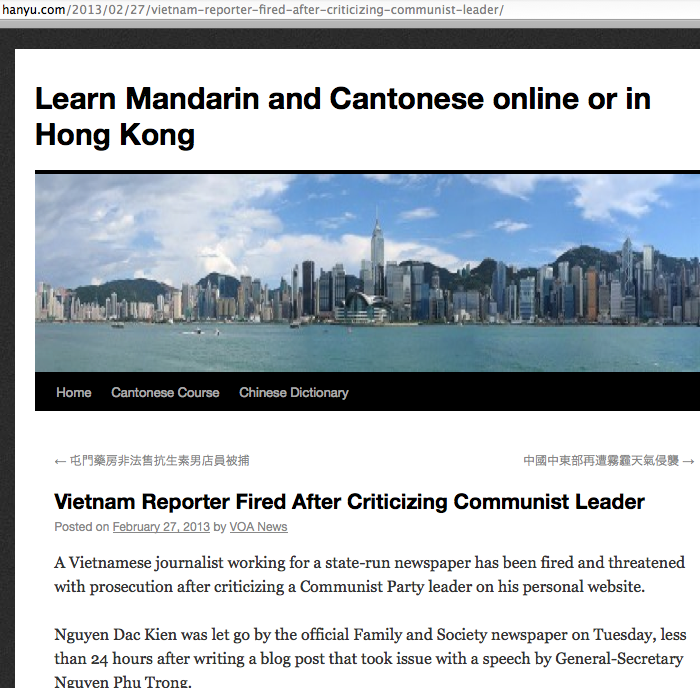 Responding in his essay, Kien said Trong had "no right to address the whole country" and only certain communist party officials wished to preserve the protected status of the party in political life. "You cannot say that it's the aspiration of the Vietnamese people... only embezzlement and corruption, running counter to the benefits of the people and the nation, are deterioration," he added. The reporter, who is married and has one young son, told AFP he was prepared for difficulties after his sacking but was worried about the impact on his family. "I will continue to pursuit my path fighting for democracy in this country," he said. Vietnam ranks a dismal 172 out of 179 countries on the latest Reporters Without Borders press freedom index. 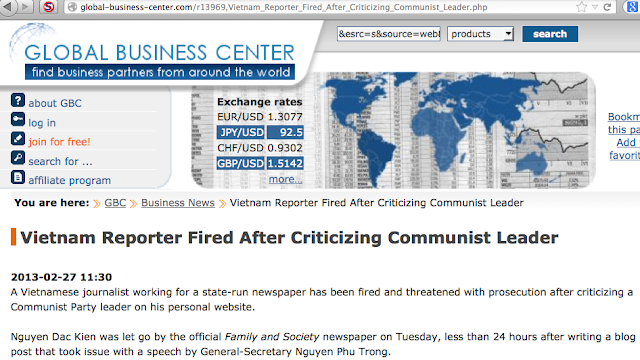 A Vietnamese journalist working for a state-run newspaper has been fired and threatened with prosecution after criticizing a Communist Party leader on his personal website. 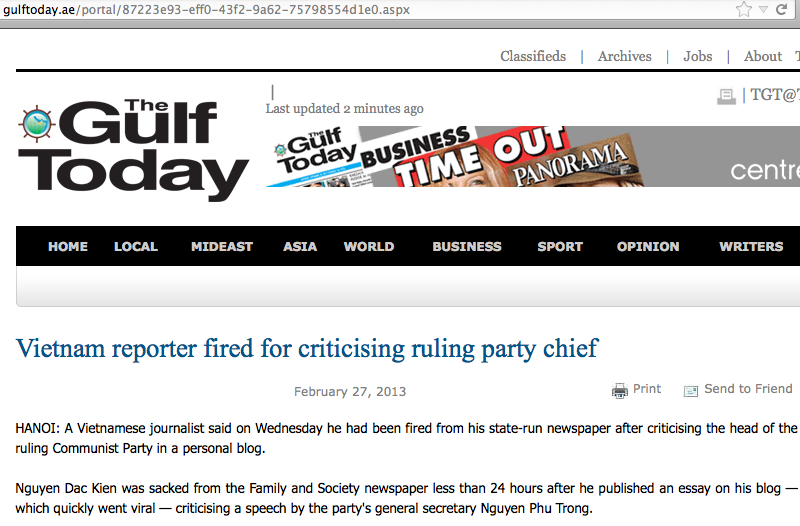 Nguyen Dac Kien was let go by the official Family and Society newspaper on Tuesday, less than 24 hours after writing a blog post that took issue with a speech by General-Secretary Nguyen Phu Trong. In the nationally televised speech Monday, the general-secretary said those who call for pluralism, a multi-party system and separation of power represent a "deterioration" of Vietnamese society. 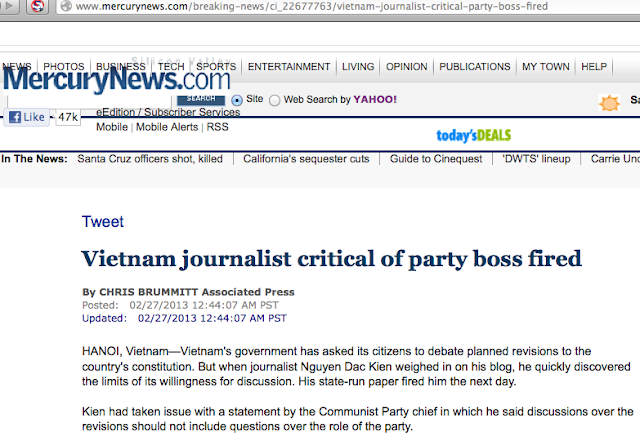 Kien's blog post, which went viral , said the leader had "no right" to address the people of Vietnam like this, saying state corruption was the real problem with Vietnam. 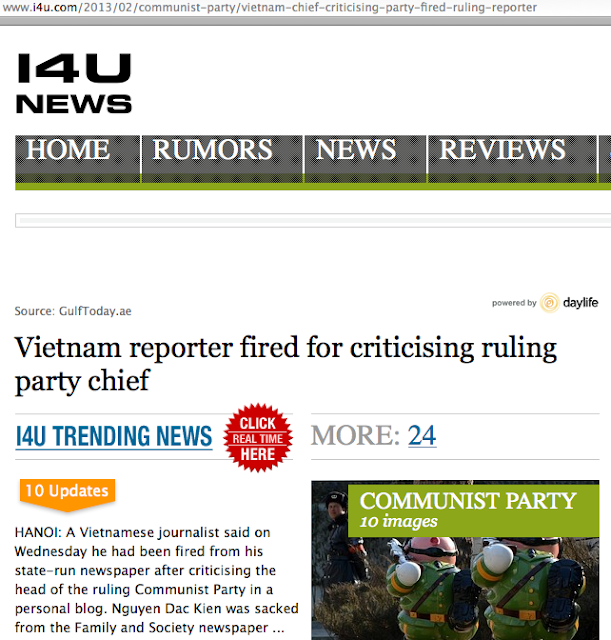 The paper, where Kien had worked since 2008, quickly put out a statement saying the reporter had "violated the operating rules" of the publication and had been fired. 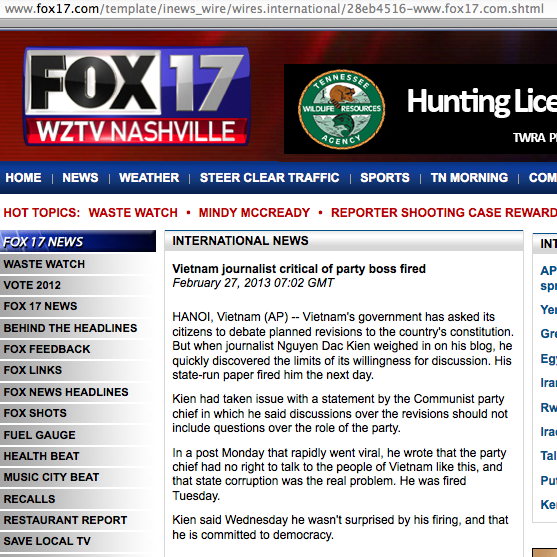 It warned he will be "held accountable before the law for his words and behavior." 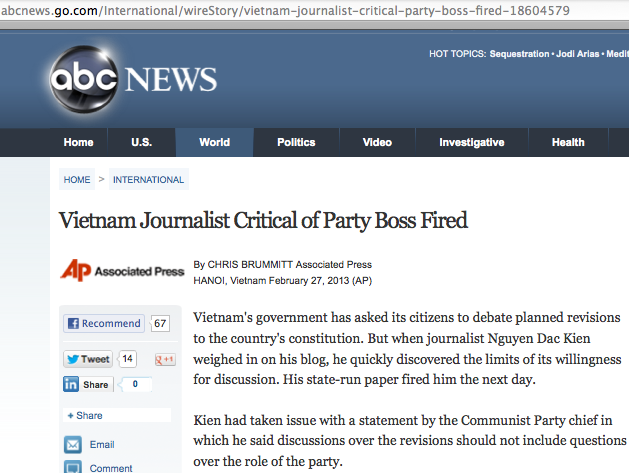 Kien, who is married and has a small child, says he had done nothing wrong, but that he is not surprised by the firing. 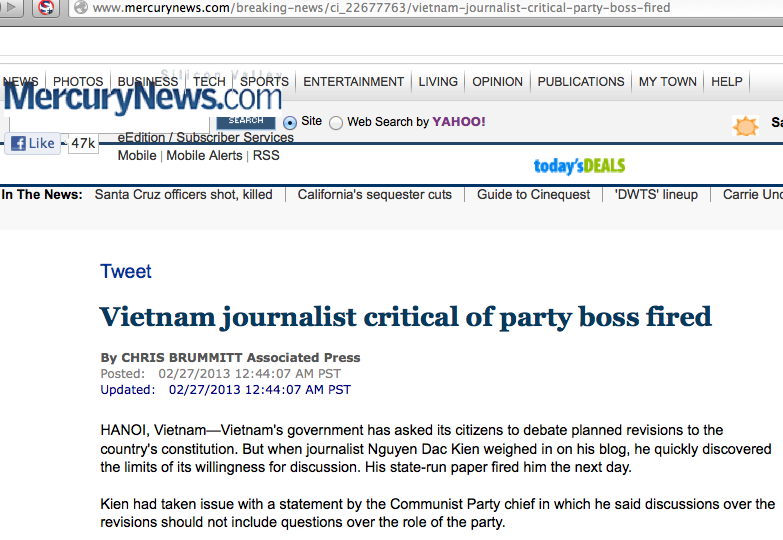 He says he will continue fighting for democracy in Vietnam and is prepared to face the ramifications of writing the article. Vietnam is a one-party Communist state that strictly forbids criticism of its leaders. 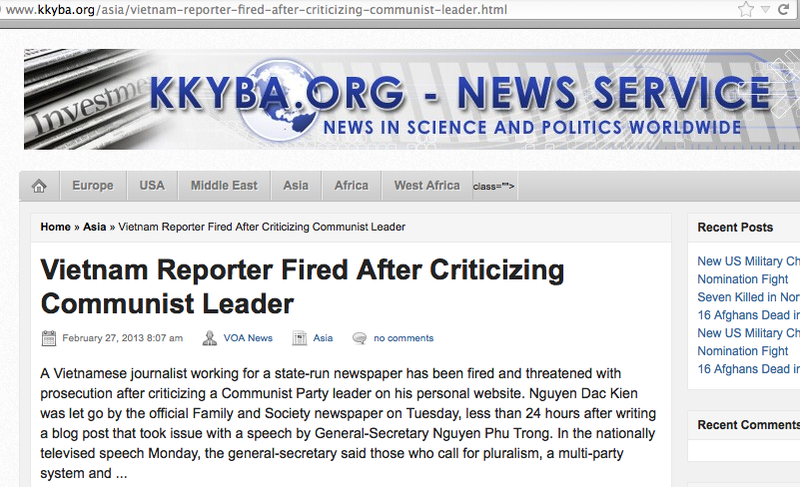 It increasingly has jailed political dissidents and activists who question the party's authority.